Catherine Hotel, Santa Catalina Island. 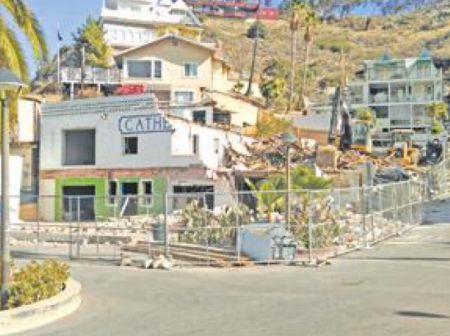 Catherine Hotel being torn down, Santa Catalina Island, 2014. Catherine Hotel, Santa Catalina Island, 708 Crescent Avenue, Avalon, is not to be confused with the Hotel St. Catherine once located at Descanso Beach. The Catherine Hotel dates back to the 1890s. Photographs as old as 1898 show the original core structure in place at that time. Originally called Sunset House because of its west-facing configuration—unique for a hotel on Crescent Avenue—the building soon became a boarding house named the Sunset Apartments, a name it held for many years.In the 1950s, former Avalon Police Chief Don Davies took over the property and after major renovation work opened the building as a hotel, bar and restaurant called the Jade Pagoda. The cinder block front of the building dateed to this time. In 1967, the hotel changed hands once more when it was purchased by Catherine Pettit. The establishment was renamed the Catherine Hotel at that time, a name it held for 45 years. 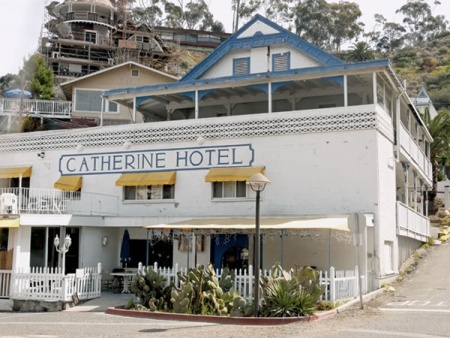 The Catherine Hotel was purchased by the Catalina Island Conservancy in 2012 to significantly upgrade the experience for Avalon visitors and Island residents who seek information about Catalina's unique plants and animals, conservation efforts, or who want to experience the interior. The hotel was torn down in 2014 to make way for a new Catalina Conservancy Visitor Center. The building will feature a bar and restaurant—possibly operated by a third party—as well as a limited number of “flex rooms” that will be able to accommodate Conservancy-related personnel for short stays. This page was last edited on 22 July 2016, at 08:07.